I love fun folds and my sister doesn't as much. 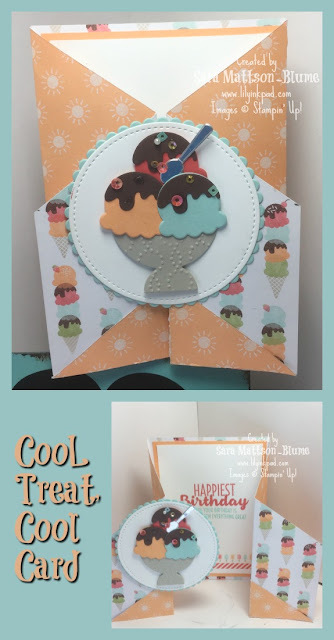 For her birthday workshop, I decided to go all out on my use of Designer Series Paper and create a fun fold. The card was loved, but perhaps, that was my awesome preparation of materials! This is a fun fold card that reveals the message inside. Plus, it stands up on its own so it's perfect for display! I used all of the papers in this package to and every one of them makes a cute card with the same sundae on front. My peeps took them home, so I have no other photographs, but trust me. Awesome cards. I love the little spoon detail. I cut them out of Silver Foil Sheets, which was pretty easy. I found that to avoid extra texture from the embossing plate on my foil, I cut little spoon-sized pieces to cut out. That way, my area left was crisp and clear of dents. This double fold gate card is made with a 5 1/2 by 12" piece of Designer Series Paper. Score at 2", 4", 8". Then, cut off a triangle from the middle of each side to the middle score lines. The final trick is to put those triangles on the bottom of the card with the opposite side up. Dawn Olcheske has an excellent video on her blog Do Stamping. That's where I learned this technique. 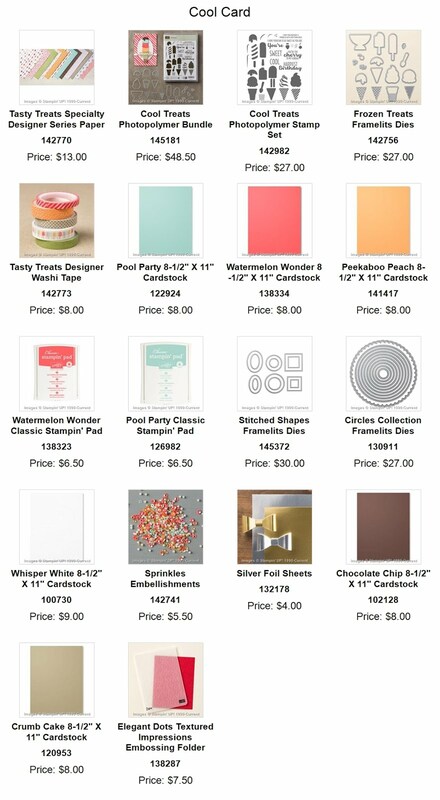 I just love this suite of products and this was really fun to design and make!